Welcome to Christ the King Episcopal Church! Thank you for visiting our website, we hope that it is the first step in welcoming you to our parish. This page is designed to help answer many of your questions before you visit. If you still have questions or concerns, please be sure to contact Fr. Matt Warren. He can be reached by email or by calling the Church Office at 530-283-2054. We are located at 545 Lawrence St. in Quincy, between the Fire House and Patti's Thunder Cafe (a popular breakfast stop for many locals!). Visitors to Christ the King can find parking along Lawrence Street or in the small surface lot adjecent to the Fire House. To enter Christ the King, please walk down the sidewalk which runs along the side of the building. 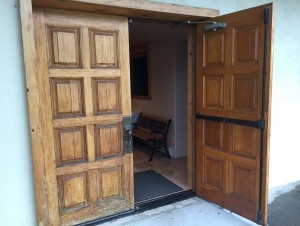 As you walk towards St. Giles' Hall (our back building), you will notice a set of double doors across from an apple tree, please use these doors to enter the Church for worship. Most parishioners and guests arrive in the ten-fifteen minutes before the service is scheduled to begin. (Our services do start promptly at the scheduled time.) Fr. Matt will be at the back of the church to welcome you to Christ the King and provide you with a service bulletin. The service bulletin contains all the readings and prayers for the day's service--so it is very easy to follow along if you are unfamiliar with the Episcopal style of worship. While there may be some parishioners greeting one another quietly, most use the time before the service begins to pray or simply sit quietly. We invite you to whatever practice helps you prepare for worship. Worship at Christ the King has a regular rythym from week to week. We use Holy Eucharist Rite II, an arrangement of prayers which include readings from scripture, a sermon, prayers, and Holy Communion. Our worship begins with a Hymn (a song of praise) from the Blue Hymnal. Our music is actually played by Synthia--a computer program which has much of our hymnal pre-programmed into her memory. References to which hymns we use are included in both the service bulletin and on a small hymn board which is located on the front right wall in the Sanctuary. During this processional hymn, Fr. Matt will walk from the back of the church up to the Altar to take his place for worship. Following the Processional Hymn, there are a series of prayers before the readings begin. At Christ the King, we regularly listen to a reading from the Old Testament (also called the Hebrew Scripture), the Psalms, an Epistle from the New Testament, and a Gospel. We follow the readings from the Revised Common Lectionary (RCL), a three year cycle which helps us to read all of the New Testament and Psalms, as well as the majority of the Old Testament. Before and after the Gospel, we will often sing a hymn and ask the congregation to stand as they are able (we do have parishioners and guests, who, due to mobility difficulties, remain seated). The practice of standing during the Gospel as a sign of respect has been practiced from the earliest days of the church, and for centuries, accompanying the gospel with another song of praise, or hymn, has been a popular feature of Christian worship. Following the Scripture Readings, Fr. Matt will offer a sermon based on the readings. The sermons are generally 12-15 minutes in length, and offers a way to understand what the Bible may be calling us to do in our own time. Following the Sermon, there are a number of prayers, including the Nicene Creed (a statement of Christian beliefs originally written in 315 AD), the Prayers of the People, and the Confession of Sin. Following the Confession, Fr. Matt will stand and pronounce an absolution and blessing over the congregation, after which follows the Peace. At the Peace, parishioners will share the Peace of God visbily with either a handshake or a hug. Fr. Matt tries to greet the entire congregation before some brief annoucements. Following announcments, there is an Offertory (collection) before the Eucharist begins. The word "Eucharist" means "Thanksgiving," and the offertory is a visible way in which we thank God for the blessings we enjoy. After a series of prayers, the congregation is invited up to the altar to recieve the bread and wine of Communion. We invite everyone to come up to the Altar at communion. If you are a Baptized Christian, you may recieve communion, and if you are not Baptized, you may cross your arms across your chest to indicate to the priest that you would like to recieve a blessing. After Communion, there is a short prayer, and the service closes with a Recessional Hymn. After the conclusion of the Hymn, Fr. Matt dismisses the congregation to "go out into the world to serve in the name of Christ." After that dismissal, the service is formally over, and we invite everyone into the Narthex (entry room) to enjoy some fellowship with coffee and snacks. Fr. Matt is available to speak after the service, and to answer any questions that you may have. We hope this offers you a brief introduction to what our worship is like and what you can expect when you visit Christ the King for the first time. We hope to see you soon!